Here in Ireland we have only 34 butterfly species — including residents and frequently encountered migrants. We have, to date, more than 1,330 recorded moth species on the island. They come in all sorts of shapes colour and sizes and are a fascinating group of oft-overlooked insects that play a crucial role in the maintenance of a healthy, functioning ecosystem. Some of them also look really cool, and they offer plenty of scope for everyone from the complete beginner to the seasoned moth expert. There’s always a challenge with moths… always something new to look at, look for, discover. When we think about moths we typically think of the night — and it’s true the vast majority of the species encountered in Ireland are mainly nocturnal. Studying them requires a moth trap of some description — a light trap, sugar trap… even a white sheet and a desk lamp will do the trick. But there are some moths that are happier, or at least equally at home, flying around during the day. Some are as beautiful and striking as any of our butterflies, others are cryptic and subtle — but no less beautiful for their finely camouflaged livery. To find and watch them you don’t need anything other than a bit of time and a keen pair of eyes — although a pair of close focussing binoculars can be a real boon to get a closer look without disturbing your subject. Identifying what you find can be a trickier proposition though — and you’ll more than likely need a handy guide you can refer to. “Britain’s Day Flying Moths — a field guide to the day-flying moths of Britain and Ireland” by David Newland, Robert Still and Andy Swash is a guide (as you might have guessed) dedicated to the identification of day-flying moths. The book is part of the excellent “Wild Guides” series, a fabulous series of wildlife guides published by Princeton University Press, and was produced in association with Butterfly Conservation. It provides individual accounts of 155 species illustrated with over 320 stunning photographs to help you identify the day flying moths you find. At the beginning of the guide is the usual field guide pre-amble explaining the difference between a butterfly and a moth, defining what the term day-flying moth means, a smidgen about moth biology and nomenclature, tips on where to look for moths and other useful information like that. Then it’s into the meat of the book — the species accounts. Arranged by family each species is afforded a full page spread, with concise but detailed descriptive text, an information panel offering key details like habitat where the species is found, flight period, size, larval foodplants and an outline of any similar species you could confuse it with. There’s also a handy distribution map to help you narrow things down to what’s likely to be found in your area (always an important feature when using a “Britain and Ireland” guide in Ireland, where we don’t get as many species). There’s also a photograph of each species showing all the key features you’d need to see to accurately identify it in the field. The book closes with a handy list of all the day-flying moths covered — giving instant access to the key details from the information panels on each species in table form for convenient cross referencing, and a few pages dedicated to conservation and legislation in relation to moths. Britain’s Day Flying Moths is a delight to browse through. The photographs are superb, and the information is very sensibly laid out. There is possibly an argument, in some cases, for more than one images of an individual species. Sometimes it helps to see a moth from a different angle, or possibly with wings in a different position, but in general the photographs are excellent, and show the key details you need to positively identify the species you’re looking at, especially when combined with the excellent descriptive text. If I have a criticism of the book it’s that it is perhaps a little bit wide for a field guide. It won’t slide neatly into a pocket. That’s not a problem if you’re carrying a small pack around with you — but quite often I don’t bother with a pack, and would perhaps hesitate to take this book with me because of its size (then inevitably kick myself when I come across a moth I can’t identify). Having said that the larger page size does give more space for each species… making for larger images and more detailed descriptions — so I guess it’s always a trade off. 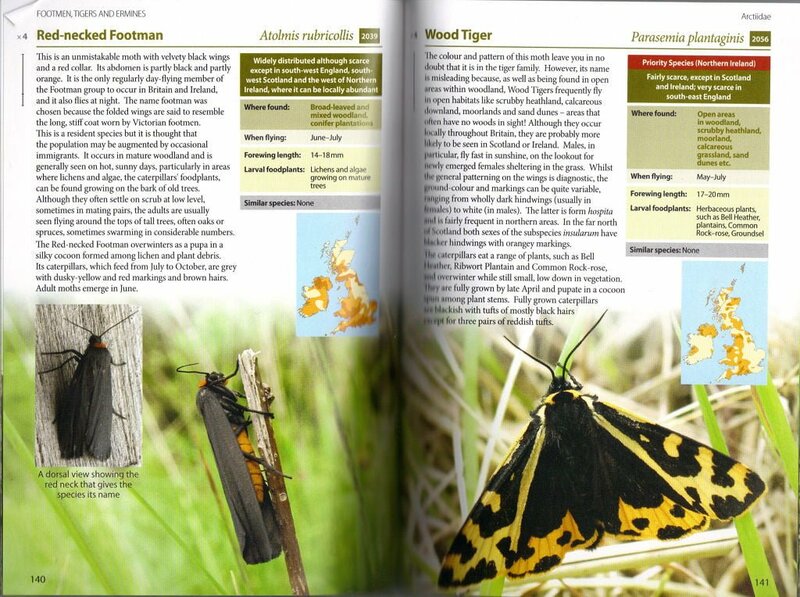 In terms of identifying the moths you see the photographs and descriptions work very well together and the succinct information panel gives you quick access to the most relevant details for pinning down an ID. It’s a very well thought out, exquisitely presented guide… it even comes with its own plastic rain-jacket — so its ready for the Irish summer! All in all this is a great little guide, and would make a fantastic addition to any wildlife lover’s collection of field guides. I’d definitely recommend it to anyone who has an interest in finding out more about the moths you can find around you during daylight hours.